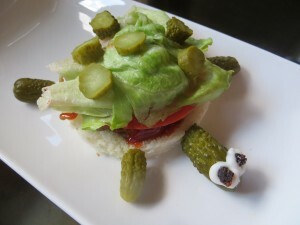 Half the fun of preparing Blimpy Girl meals is coming up with a name for the finished dish. 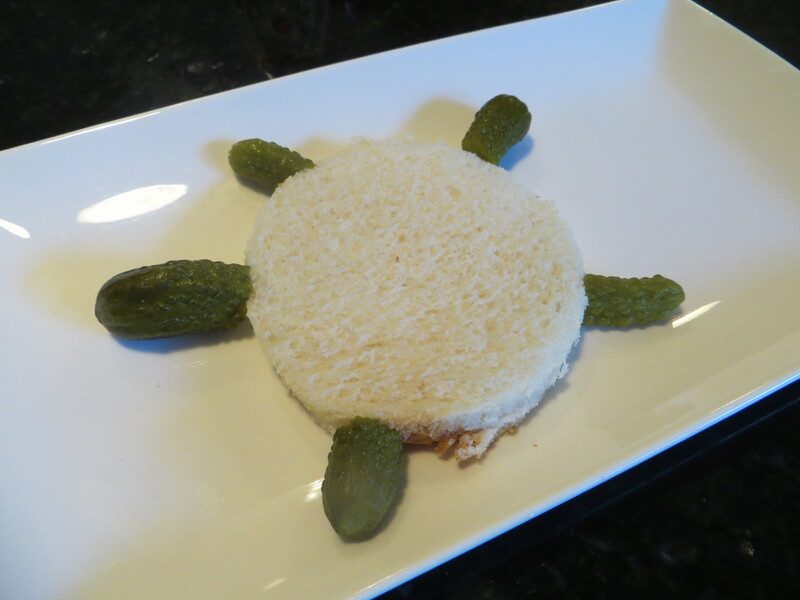 This dish is named after one of my favorite story book characters. My concoction has chicken meat and eggs along with fresh garden goodies: tomato, onion, green pepper, pickle relish, celery and lettuce. I promise the sky won’t fall when trying this recipe and Henny Penny would be proud that farm fresh ingredients were used. I threw together this dish before heading out for a steamy day on the lake. As usual, I grabbed food items available at the time. I keep plenty of chicken breast on hand (thank you, Costco) and garden items are at their peak (YES!!). 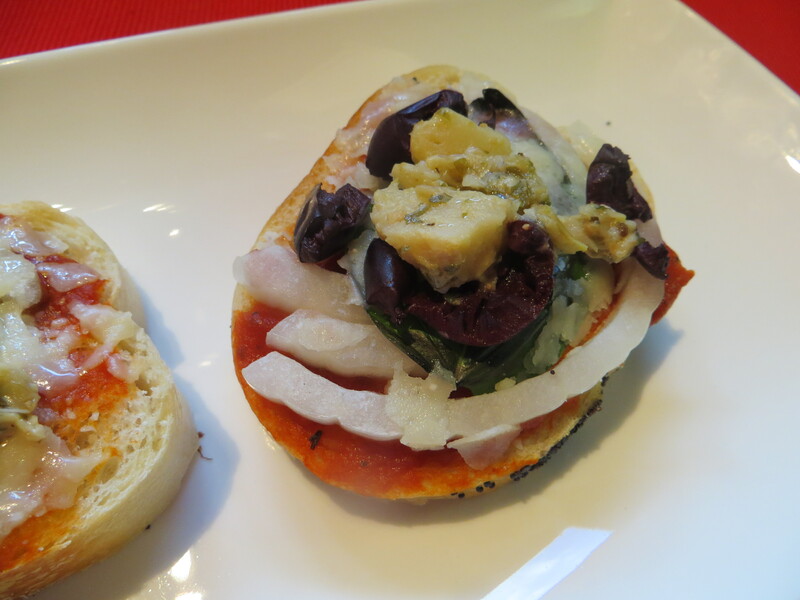 When I discovered a loaf of French baguette bread in the freezer, the meal plan began to unfold. 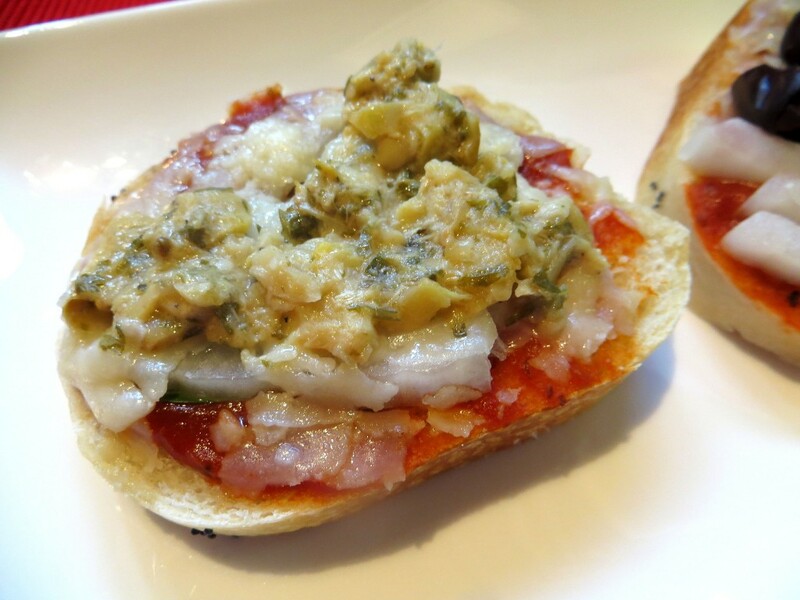 This is a sandwich recipe that “goes with the flow”. If you don’t have celery, then use grated carrot, if you don’t have green pepper, use diced green olives. 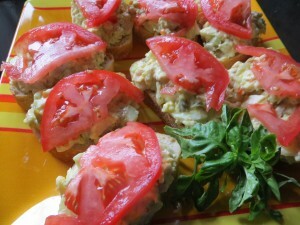 You can shred zucchini, add basil leaf, even serve the chicken mixture in red/yellow bell pepper halves. There are so many options for this easy-to-prepare dish. Salt / Pepper to taste. NOTE: if using green olive, which are already salty, cut down the amount of salt used. 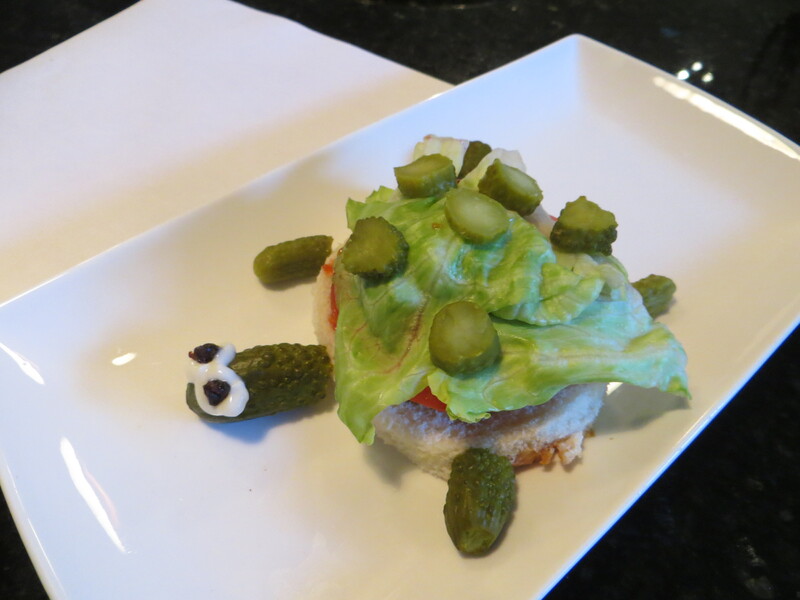 Mix together all the ingredients except the lettuce and tomato slices. Top each baguette slice with a lettuce. 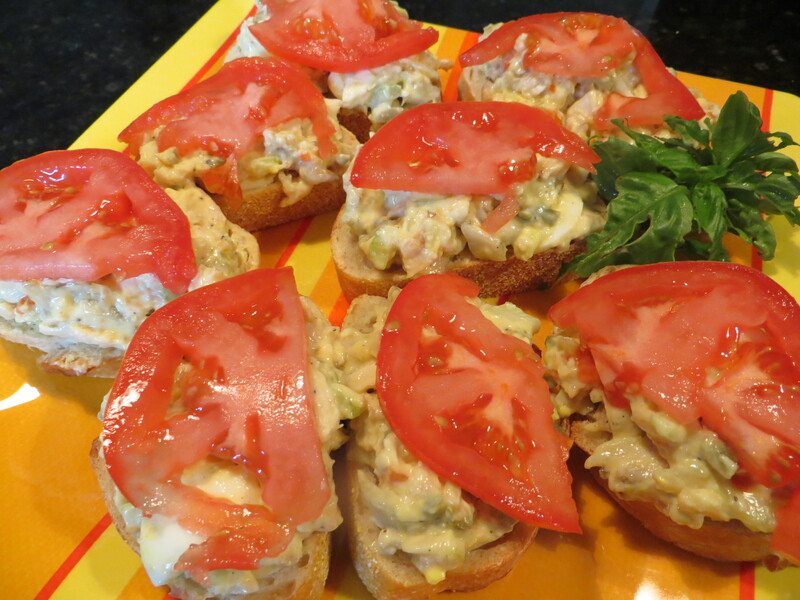 Spread chicken mixture over lettuce and dress with a tomato slice. This recipe makes approximately 12 sandwiches. Calories, depending on your options are around 170 calories per serving. Add a spinach salad with a low-fat vinegarette dressing, carrot sticks or broccoli florets and you have a 200 to 225 calorie meal. Heck, if you’re still feeling hungry, chow down a second sandwich. Omit the bread and save on calories for the indulgence. Michigan is setting record breaking temperatures this summer. Heck, we haven’t had rain in three weeks. Grass is fading to brown, temps are soaring and everyone is looking for ways to cool-off. My cool-off idea was to pull out the grill and roast fresh peaches! Yep, roasted peach slices. Pair it with coconut milk and shredded cocount for a savory summer popsicle. My soap making company sells the popsicle and pop sticks. But, in 95 degree weather, I discovered a better way to use the mold. Bite size filo cups filled with ice cream goodness. The pops were very tasty with just enough sweetness to satisfy. I hope the grand kids give this summer treat a thumbs-up. 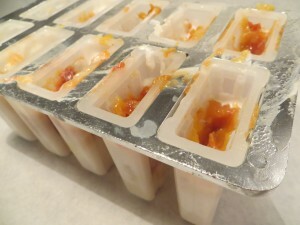 If you don’t want to invest in a pop mold, freeze mixture in a plastic tub. When ready to serve, place scoops into parfait dishes and drizzle with honey (and coconut). This picture is an indicator of the high temps we are experiencing. I took a bite from the popsicle and it was already melting. That’s OK, it only took me one minute to eat it! Here’s the scoop on how to make these yummy summer treats. 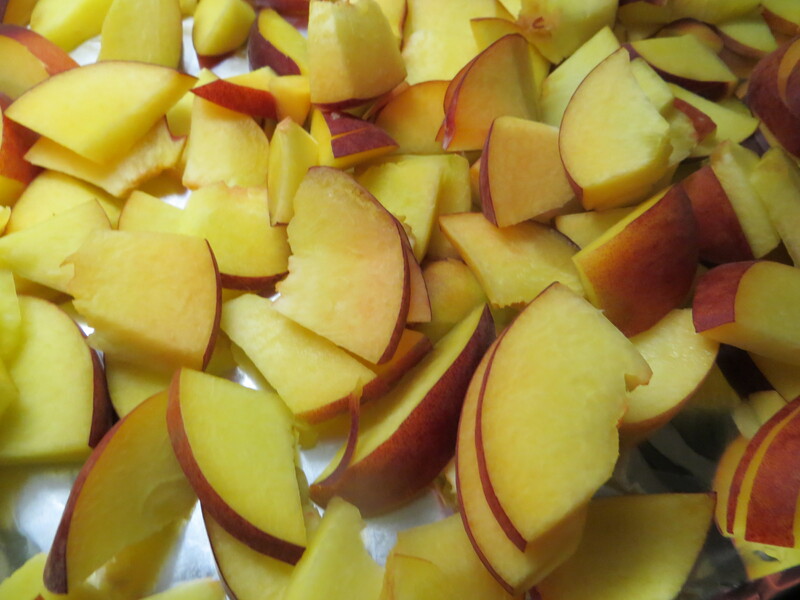 Leave skins on peaches, slice into wedges. Spread out onto cookie sheet and sprinkle with lemon juice. Roast in oven at 400-425 degrees. 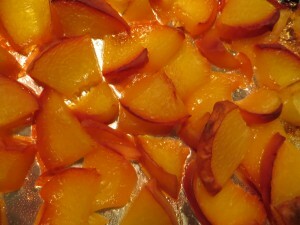 Bake until the peach slices start to caramelize (about 25-30 minutes). Remove and dice into smaller pieces. Set aside. Blend coconut milk, shredded coconut and vanilla extract until creamy. Pour mold cavities 1/3 full of the coconut milk. Drop 2-3 diced peaches into each mold. Place in freezer and let set for 30 minutes. Remove mold from freezer. 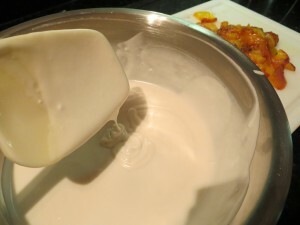 Drop in more peach pieces (try to evenly distribute), add another layer of coconut milk and freeze for 30 minutes. Remove mold from freezer. It’s time to pour the final layer. Top off mold cavities with the coconut milk, evenly distribute additional peach slices. Insert the pop sticks. Place in freezer for a minimum of 3 hours. The pops should be frozen solid once removed. 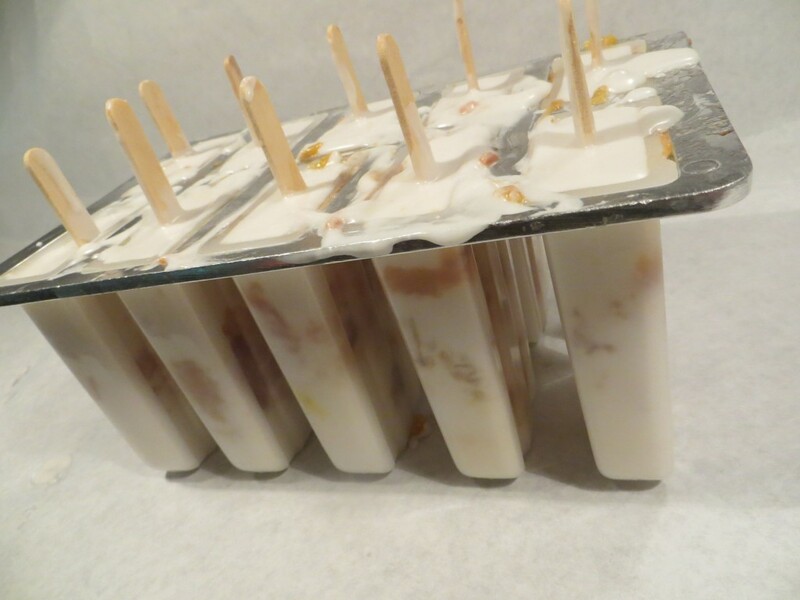 The popsicles may require a quick soak in warm water for removal. Note the word “quick”. If you soak too long, the pops will begin to melt. Make single serving bite-size desserts. Place any leftover popsicle mixture in a plastic tub and freeze. 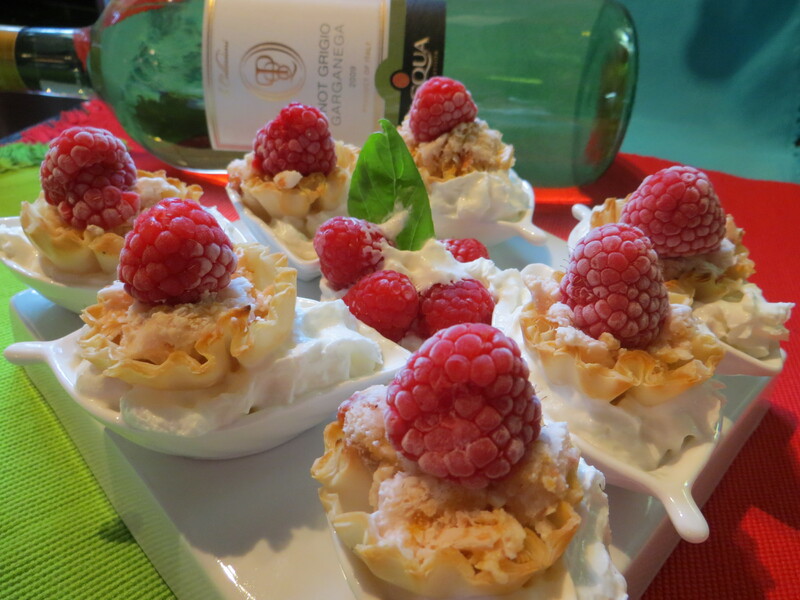 Using a melon baller, scoop out ice cream mixture and place into a mini filo cup. Dress with a raspberry and whipped cream. Serve immediately. Use small binder clips to keep sticks centered in each mold cavity. 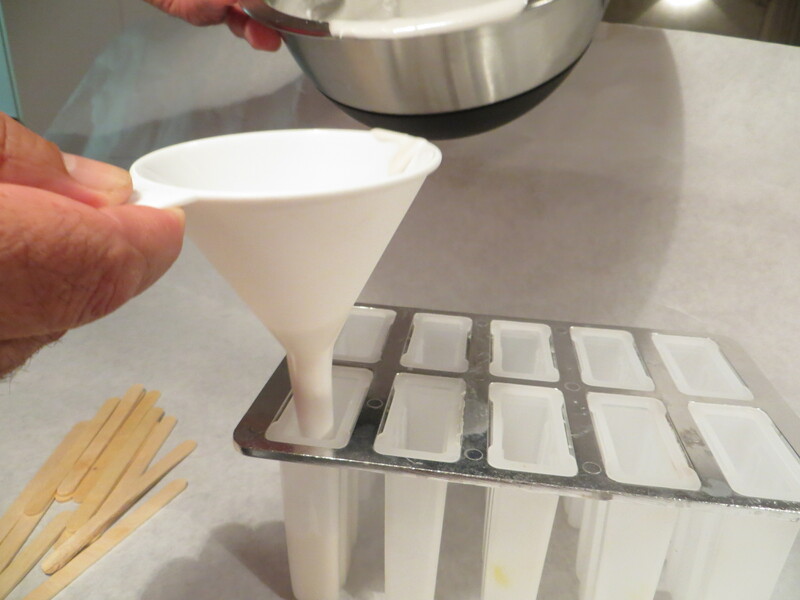 You don’t have to use a popsicle mold. Consider freezing the coconut mixture and scooping out servings into a parfait dish. Top with shredded coconut. 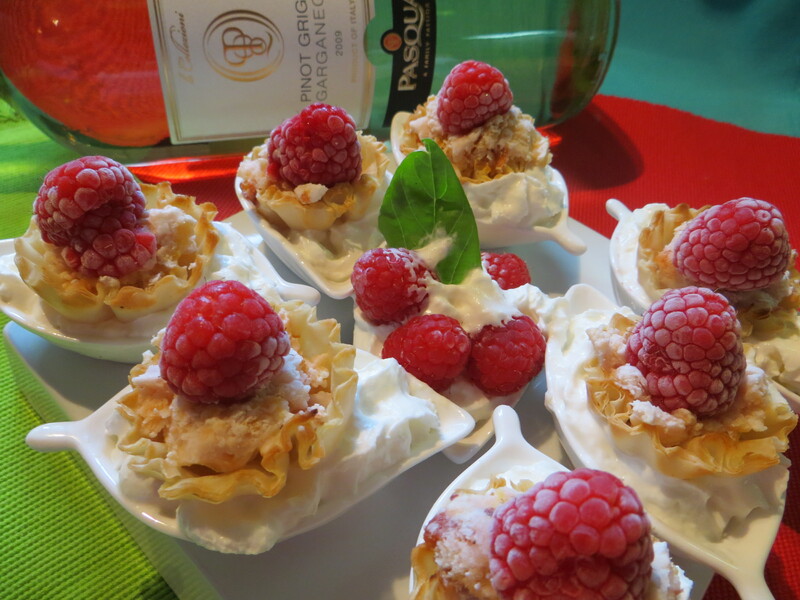 Serve petite single-serve portions with a chilled glass of Pinot Grigio wine. You can dip the filo cups into melted chocolate… YUMMM! Use mini filo cups to serve up this delicious ice cream. 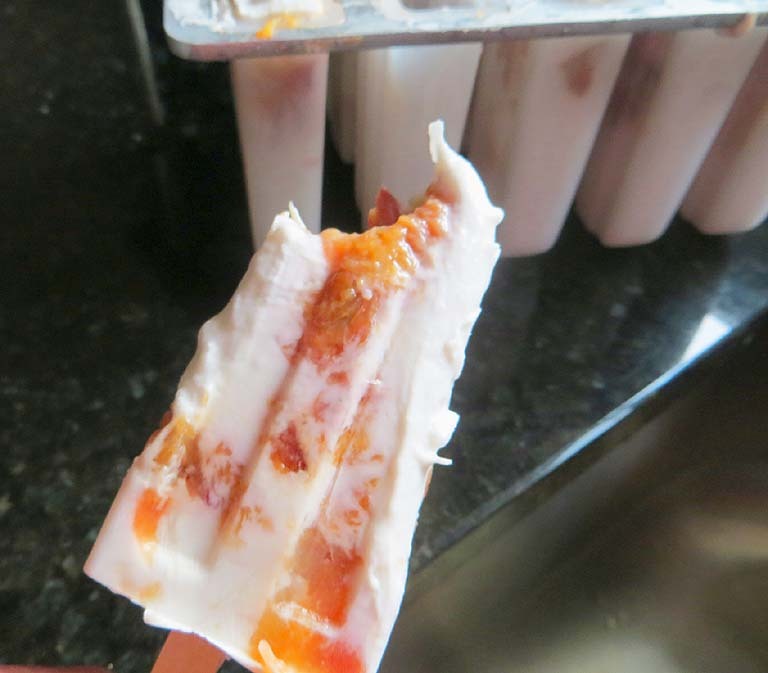 This recipe makes 12 (6 ounce) popsicles, PLUS there is plenty leftover to make 24-36 bite size filo cups. OK, let’s talk calories. You’re in the neighborhood of 28 calories per ounce for the coconut milk. One whole peach (roasted) and a tablespoon of grated coconut (unsweetened) adds 203 calories. A 6-ounce popsicle is 150 calories. The only down-side of using coconut are fat calories. They’re fairly high. But, an occasional indulgence shouldn’t affect your weight loss goal. The bite-size filo cups might be a better option (as pictured above). They appease the sweet-tooth, and are less than 30 calories (per filled cup) if using fat-free whipped cream. Every year, the wine guy and I mark our calendars for fig season. Today we rejoiced! Fresh mission figs were available at Costco. If you’ve never experienced grilled figs with dollops of goat cheese and basil… you haven’t experienced life. It’s a culinary delight. The tray of figs were cut in half. Leave the seeds intact. I soaked wooden skewers in water for 20 minutes. This keeps the skewers from burning on the grill. You only need to grill for a few minutes under low heat. Promptly remove the figs from the skewers and top each fig with a dollop of goat cheese. Fresh basil leaves add to the flavor. 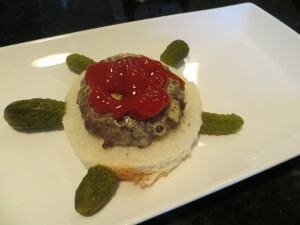 You may want to chop the basil first and then sprinkle on top of the goat cheese filling. This appetizer is best served warm, but the wine guy and I were headed out for a day on the lake. 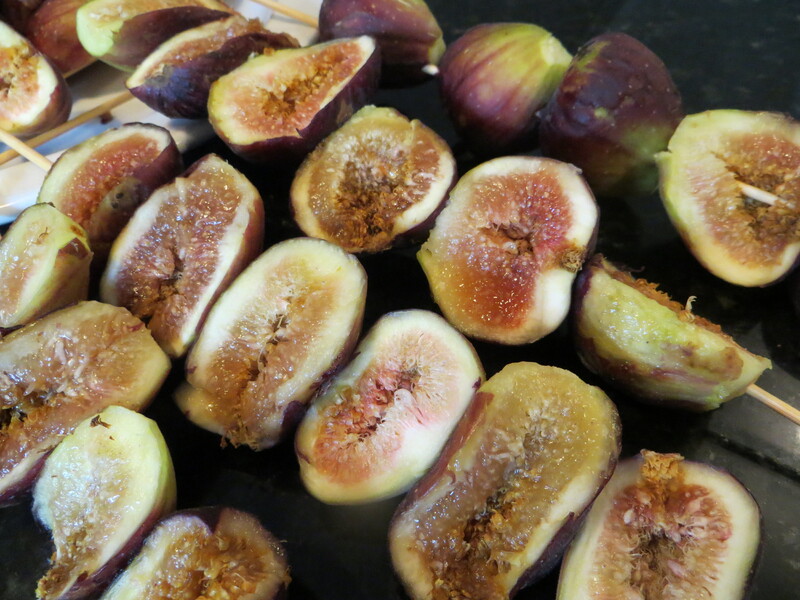 We put our coveted figs in a cooler and quite honestly they were tasty even when chilled. We are picking up another tray of figs at Costco this week. There are 24 mission figs in a tray. Cutting the figs lengthwise yields 48 bite-size servings and is in the neighborhood of 45 calories per fig (including goat cheese and basil topping). According to the California Fig Advisory Board, figs contain more fiber than other common fruits and vegetables. One medium fig contains 1.7 g of fiber. 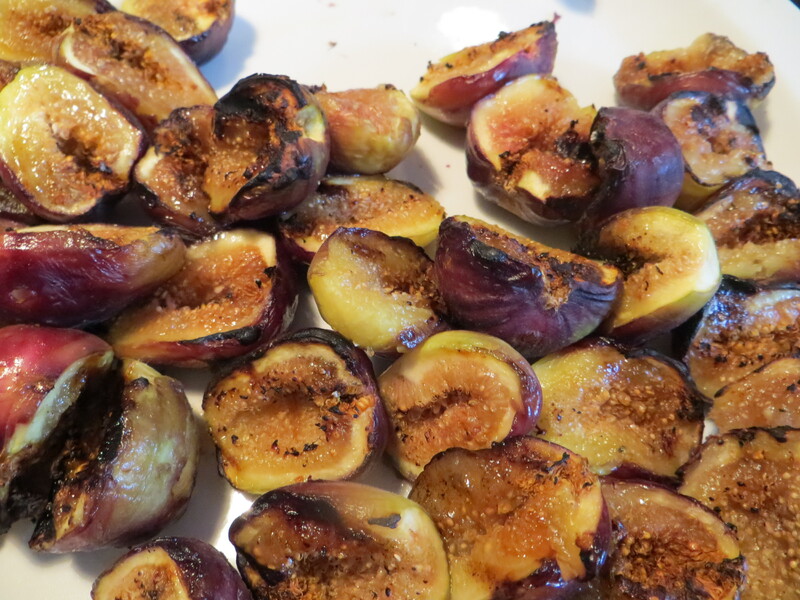 If you eat 4 ½ medium figs, you satisfy 30 percent of the daily recommended allowance for fiber. Fiber is essential to regular digestion, a healthy colon and beneficial in lowering lower cholesterol. 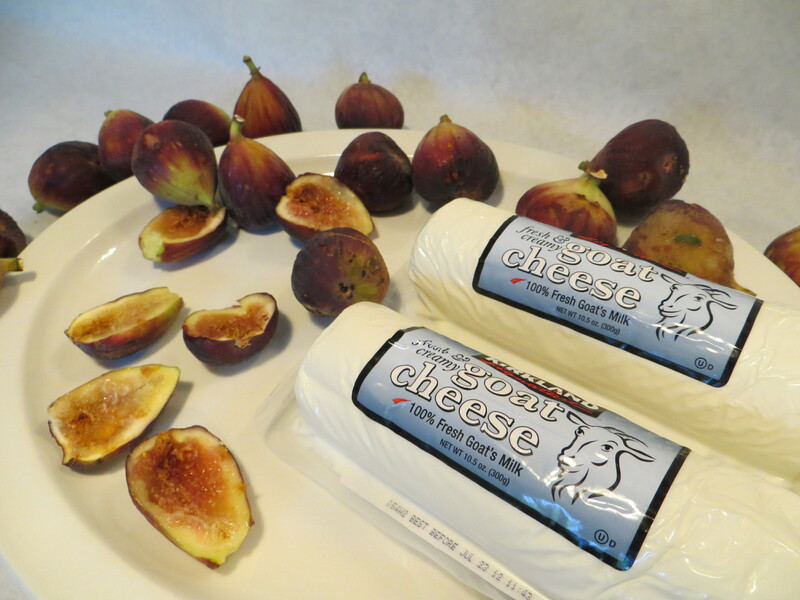 Oh, and let’s not fail to mention that figs are a great source of calcium and potassium. Pencil in a date night with a figs while they are in season.